Known as Lexington’s town dog, and nicknamed the Canine Con Man, the Magnificent Moocher, and the Panhandling Pooch, Smiley Pete was a friend to all. He was so well loved, he often graced the front cover of both the Lexington Leader and the Lexington Herald, whether it was for catching an opossum, posing for a local charity, or showing off his litter of puppies. 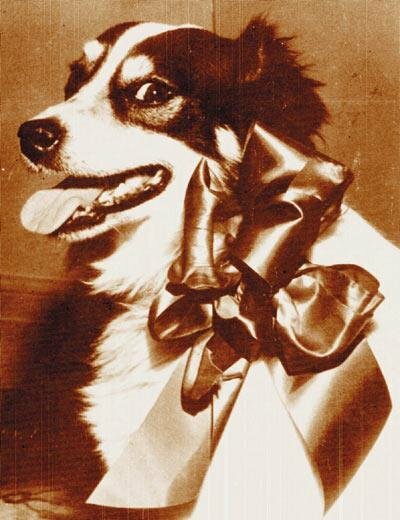 Pete was born in 1943 and came to downtown Lexington around 1946 after his owner, rumored to be a traveling man, gave up trying to keep the wandering pup home. This suited Pete just fine; he set up his new home on the sidewalk between Welch’s Cigar Store and Brandy’s Kitchen on the east corner of Main and Limestone Streets, where the courthouse sits today. Pete was a mutt, but you’d never guess it seeing him strut up and down the streets of downtown. Some have speculated that he was most likely a mix of spitz, shepherd, and bird dog. It wasn’t long after that the people of downtown started calling Pete, Smiley Pete, for his distinctive tooth-baring grin. A moocher by profession, Pete had quite a schedule. Breakfast usually consisted of hamburgers and waffles prepared for him by Robert LeClere of Brandy’s Kitchen; lunchtime led him in the direction of University of Kentucky’s campus where he would sometimes stop in for a lesson and a bite to eat; afternoons you could find him lapping up a nice, cold beer, preferably draught, from Elliston’s Turf Bar, or enjoying a few Hershey bars at Paritz’s Short & Lime Liquor Store. And every day around 4 p.m., when Pete was craving actual dog food, he would stop in Carter’s Supply Co. for a bowl-full and some water. Smiley Pete would travel up and down the streets of downtown, crossing busy intersections up to 50 times a day, without a care, causing many to believe that he could actually read the traffic signals. Many people tried, unsuccessfully, to adopt Pete, but that just wasn’t his style. He liked his freedom too much. He would rarely enter any of the downtown shops, even when he was coaxed with food, although he did manage to get himself locked inside Hart’s drug store in 1954, much to his chagrin (Lexington Leader, Feb. 14, 1954). The only dog allowed to roam freely by local police, Smiley’s ventures ended briefly, one summer in 1949. Lexington had a rabies scare and every dog was put under quarantine, even Pete. Store owners collected money to have him put in a kennel at Del-Tor Clinic on Southland Drive until the epidemic passed. Pete was not happy about this turn of events, but after a three-month stay he was set free to wander the streets again. He was such a friendly dog, even tourists fell in love with him. One New York woman, in particular, caused quite a stir when she apparently saw a police officer “viciously and brutally kick a friendly, tail-wagging mongrel” on the corner of Main and Limestone. Myrtle Pearce wrote a letter to Chief of Police Dudley McCloy stating that “the reflection is on the city of Lexington…In all my life, I have never witnessed a more sadistic and brutal assault upon an innocent animal.” There was an investigation but no one was charged. Joe Tyson, retired fireman and one-time patrolman of Main and Limestone, said he saw it all. Pete did his part for the local charities as well. He was featured, once again, on the front page of the Lexington Herald sporting a Red Cross volunteer band. He took part in the March of Dimes and was named an honorary member of the Lexington Humane Society. A favorite with the ladies, Smiley fathered one litter of puppies in 1952 (if he hadmore, they weren’t documented). The seven pups were proudly displayed in the storefront window of the Foushee Flower Shop on Limestone Street for a week. Pete met the special lady at Del-Tor Clinic during one of his regular checkups. During a visit to Del-Tor in 1957, Pete was diagnosed as being obese and allergic to chocolate, so he was put on a diet. The local paper printed an appeal asking that friends of Pete stop feeding him his daily Hershey bar. Over the next few weeks, Smiley seemed to get better, only to lapse once again. It seemed Pete’s mooching days had finally caught up with him. Pete was never forgotten nor will he ever be thanks to Mr. and Mrs. Welch and friends who made him a permanent fixture to Lexington’s downtown. Although Pete could not be buried at any of his hangouts, business owners donated money to purchase a bronze plaque that is still near one of Pete’s favorite places, the corner of Main and Limestone. “One of the things I remember the most was the way he would lie down on Main and Limestone and hang his paws over the curb—even though they got nicked quite often,” said Kathleen Welch. Pete has been forever remembered in other ways as well. The Downtown Lexington Corporation dedicated a “Smiley Pete” award which is given to the organization, business, or individual who has made a great impact on how people feel about downtown Lexington. Lexington City Brewery, when it was open, named a beer after Pete—Smiley Pete Stout. And, of course, the publishers of Chevy Chaser and Southsider magazines decided to name their parent company Smiley Pete Publishing, even though neither one was born before Smiley Pete’s death.